Crochet baby hats are just so sweet. They work up quickly and they look adorable. 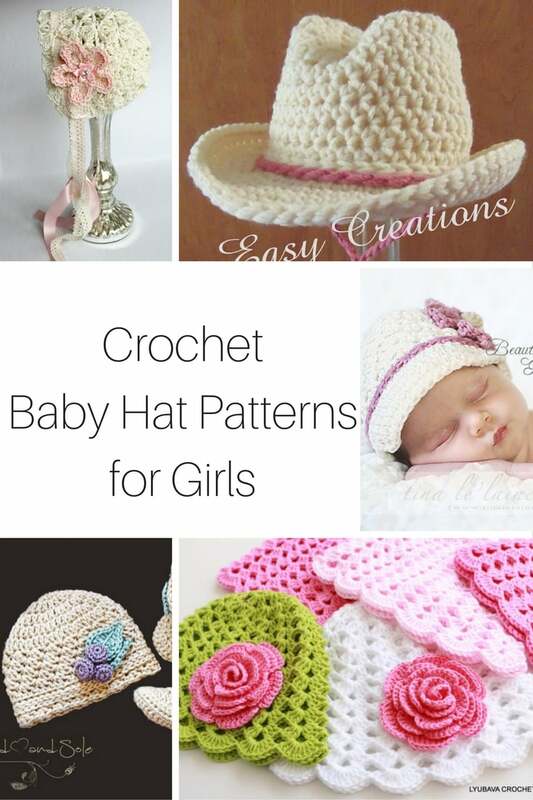 Here you can find a great collection of crochet baby hat patterns for girls. After making a few hats myself, I thought it would be great to find crochet hat patterns that are perfect for little girls. Stay tuned in the upcoming weeks to find handsome crochet hat patterns for boys. Easy little crochet beanie hat with a small flower applique. This adorable had shows Patriotic spirit with cute little stars and of course, the red, white, and blue colors. I love how sweet this looks. Perfect little hat for summer time. This is a cute little sun hat! Perfect for keeping the sun off baby. Love the little ribbon and bow on this hat. Looks pretty simple to make! Since the Trolls movie just came out, we can’t leave out this super cute poppy hat! Love how she added the troll hair to the hat. It’s perfect. This Newsboy hat is super cute with the added daisy applique is perfect! This little earflap hat is so cute! You could make it a soft pink or purple and it would be perfect for little girl. Add a pom pom or not. The hat is cute both ways! I can not resist a cute owl hat. I just think they are adorbs. Would make a cute photography prop as well! I love this little hat and the matching booties are just adorable! Remember those cute dolls from the ’80s that everyone had to have? Check out this crochet hat pattern that can turn your little girl into a Cabbage Patch Doll! I just adore this hat with two pom poms! It is so sweet looking! Know a farmer or rancher having a baby girl? This little cowgirl hat is a perfect baby shower gift! This hat is perfect for any Easter babies out there! Too cute! Love the floppy ears! Are you a Disney fan? This little hat is perfect for your little girl. Complete with Mouse ears. Nothing is sweeter than this lacey bonnet! It is just perfect for a baby girl. Would make a beautiful photograph prop as well! Always choose to be a unicorn. The rainbow mane is perfect too! Oh My Word! I can not get over this hat! It is perfect. Bonnets are just sweet when it comes to newborns. This one is beautiful as well. OMG! I am in love with this hat! It reminds me of a 1920s hat. Just too cute! Which one do you plan to make?